Army Seva Vanitha Unit President Mrs. Priyadarshani Damayanthi Ratnayake receiving the donation from Macbertan Pvt Ltd Director Cheminda Amarasinghe and General Manager Upathissa Abeykoon. 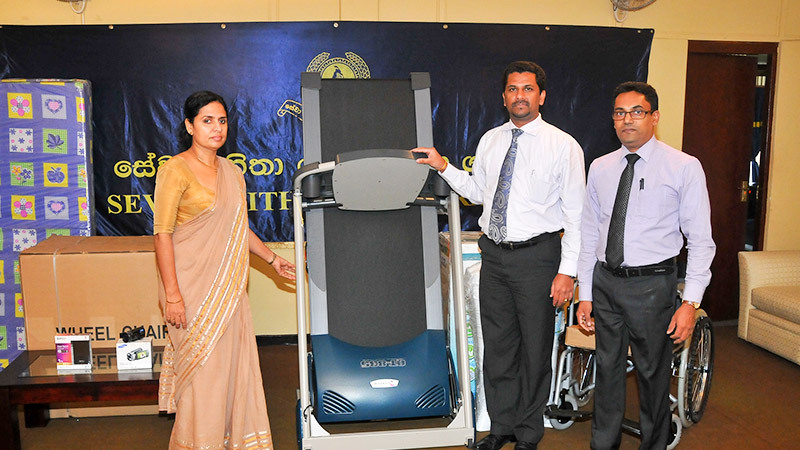 Macbertan (Pvt) Limited, Manufacturer of McFoil roof heat insulation products in Sri Lanka contributed to the war heroes by donating medical equipment , gymnasium equipment and other items to the “Brave Hearts Wellness Resort” of the Sri Lanka Army (which is also known as the Abimansala). Over 50 war heroes are being housed by the army with all facilities, amenities and necessary medical attention at this facility. The donation made to the Abimansala also included McFoam specialized mattresses manufactured and marketed by Macbertan (Pvt) Limited. The equipment were presented at a ceremony held at the Army Head Headquarters in Colombo recently to the president of the Sri Lanka Army Seva Vanitha Unit president Mrs. Priyadarshani Damayanthi Ratnayake by Director / COO of Macbertan (Pvt) Limited Mr. Cheminda Amarasinghe and the General Manager Sales and Marketing Mr. Upatissa Abeykoon. The items donated are expected to give a significant boost to the Abimansala Wellness Resort which has been established by the Sri Lanka Army to provide lifelong medical care and other facilities to the war veterans who were disabled while fighting to achieve peace in mother Sri Lanka.